Look up goatherd in Wiktionary, the free dictionary. A goatherd or goatherder is a person who herds goats as a vocational activity. It is similar to a shepherd who herds sheep. 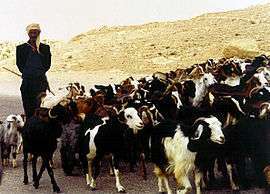 Goatherds are most commonly found in regions where goat populations are significant; for instance, in Africa and South Asia. Goats are typically bred as dairy or meat animals, with some breeds being shorn for wool. The top six goat industry groups in the United States include: meat (includes show), dairy (includes show, pygmy and Nigerian dwarf), fiber or hair (angora, cashmere), 4-H, industrial (weed control, hiking/pack), and biotech (see Goats in agriculture). Companies using goats to control and eradicate leafy spurge, knapweed, and other toxic weeds have sprouted across the American West. Fictional goatherds include Peter from Johanna Spyri's Heidi, and the song "The Lonely Goatherd" from The Sound of Music. Enid Blyton's novel The Secret of Killimooin, set in the fictional but probably eastern European country of Baronia, features a blind goatherd called Beowald, so in tune with his environment that he can roam the mountains using his other senses, apparently unhindered by his lack of sight. The Link who appeared in The Legend of Zelda: Twilight Princess was also a goatherd. ↑ "Breeds of Livestock - Goat Breeds — Breeds of Livestock, Department of Animal Science". www.ansi.okstate.edu. Retrieved 2015-10-18. ↑ "American Pastoral". Brown Alumni Monthly. Sep–Oct 2012. This article is issued from Wikipedia - version of the 12/19/2015. The text is available under the Creative Commons Attribution/Share Alike but additional terms may apply for the media files.